Over 750 dinner guests attended at the prize cermony when the Detektor International Award dinner was held in conjunction with the second day of SKYDD 2010 on the 15th of September. The twelve awarded finalist products were chosen on the basis of both innovation and customer orientation. Winning products need to be smart as well as useful, as Lennart Alexandrie, the publisher of the security technology magazine Detektor, explained previously during a presentation. 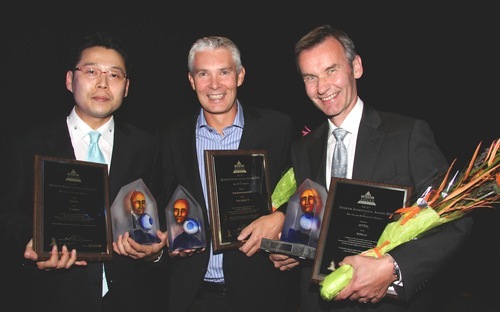 Two Scandinavian and one Korean manufacturer received the top awards. Steve Ham, Suprema, Fredrik Thor, Axis and Yngve Wold from Idteq received the first prizes when the Detektor International Award Ceremony was held on wednesday night. The criteria to be nominated for a Detektor International Award encompasses not only the technical solution but also the packaging and over all presentation of the product, which actually could just as well be a service. "The Detektor International Awards should be viewed as a focus on continual technical development, but just as importantly they should encompass the continual progress of demands for more sophisticated packaging qualities, where the presentation of the whole concept becomes increasingly more of a priority to successfully reach the customer", Lennart Alexandrie said. It was the 11th annual Detektor International Award prize ceremony, this time held at the International Stockholm Fair in Sweden, Lennart Alexandrie, CEO for AR Media International, the publishing company behind Detektor magazine, was the master of ceremonies. The three product categories for the awards are Access Control, Alarm and Detection, and CCTV. The "Best Product Award" in the Access Control category went to Suprema from South Korea for its D-station, an access control solution incorporating dual finger access and face recognition. “Complexity, simplicity, precision and efficiency in one package – a pure triumph for innovation” , declared the panel of judges as the motivation of picking D-Station as the overall winner in the Access Control category. The "Highly Commended Product Award " was awarded to HID from USA for the Omnikey 2061, a bluetooth reader from HID. The "Innovative Achievement Award" in the Access Control category this year was shared by Iloq from Finland - for Iloq Privos, a locking solution for residential and small-commercial use – and Assa from Sweden - for Aperio E100DS, a wireless door reader. The "Best Product Award" in the Alarm and Detection category went to Idteq from Norway, for the AIM100, an intrusion infrasound acoustic-sensing detector. The "Highly Commended Product Award" in the Alarm and Detection category was given to Dualtech IT from Sweden for DALM 5000, an IP-based alarm dialer used as an external dialer. The Alarm and Detection "Innovative Achievement Award" was shared by Electronics Line 3000 from Israel – for its CommPact, a small wireless residential/small commercial security and control solution – and GPS Standard for its Radar an electromagnetic wave system for perimeter protection. The "Best Product Award" in the CCTV category went to Axis Communication for the Q1910-E, the world’s first thermal network camera. This choice, by Detektor International's panel of judges, was explained by the following motivation. “With the world’s first thermal network camera Axis contributes significantly to enhanced detection for perimeter protection in industrial applications”. The "Highly Commended Product Award" in the CCTV category was given to Arecont Vision from USA for AV8365, their 8 megapixel 360 degree panoramic network camera. The "Innovative Achievement Award" of the CCTV category was shared by Avigilon from Canada - for Control Center 4.6, an open network video management software for HD-devices – and Veracity from the UK, for Coldstore, a digital surveillance storage system. The Detektor International Awards’ panel of judges consists of a total of 9 members from 6 different countries that all are represented in the editorial board of DETEKTOR, as well as an external independent consultant.